Inlanta Mortgage Chairman, John Knowlton, announced the promotion of Mr. Paul Buege to the role of President. Mr. Buege is currently the Chief Operating Officer and will continue those responsibilities. Nicholas DelTorto will remain as CEO. “I am proud to announce Paul’s promotion to President. It has been a privilege to work with and get to know him over the past five years. Paul and his team have developed a premier service platform for our loan originators and consumers. He is dedicated to Inlanta and the continued growth and success of our company,” Knowlton said in a company statement announcing the move. “Our senior management team has positioned us for a solid future. We have worked together for many years and that continuity in leadership translates into a consistent focus on improving our platform, performance for the branches, and highest level of progressive services and technology for our referral partners and consumers,” said DelTorto. “Paul has done outstanding work in developing a sales and service accountability culture at Inlanta. Our ‘mortgage banking for grown-ups’ approach allows the true mortgage professional to operate using their personally developed skills to build on their success,” Knowlton adds. Inlanta announces this move as they celebrate 25 years in the mortgage business. “We are very proud to celebrate our 25th anniversary this year. In a business where so many have come and gone, Inlanta is looking forward to serving our customers and referral partners for many years to come,” Knowlton said. Inlanta Mortgage continually seeks branch managers and loan officers who want to grow their business. 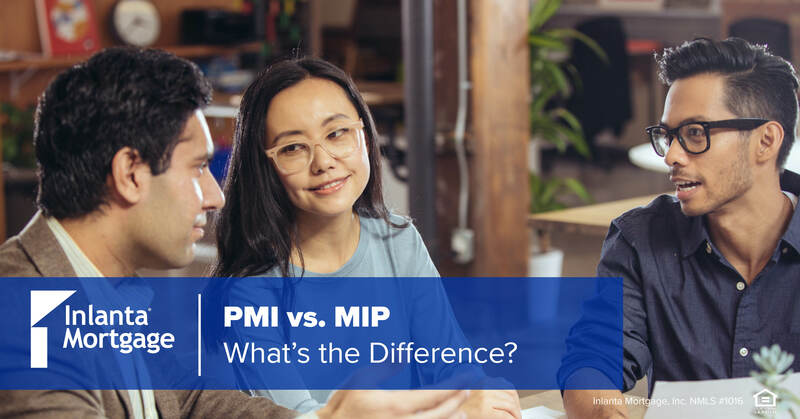 To learn about growth opportunities, please contact Brian Jensen (Midwest) at brianjensen@inlanta.com or 630-927-0380; or Kevin Laffey (Kansas, Missouri, Iowa, Nebraska) at kevinlaffey@inlanta.com or 913-645-4647. To learn about opportunities in other locations, visit http://www.inlantapartners.com, call 262-439-4260, or email partners@inlanta.com. Do you feel like your debt is holding you back in life? If you’re feeling overwhelmed by your finances, we’ve got a step by step process for you to start taking control of your debt today! 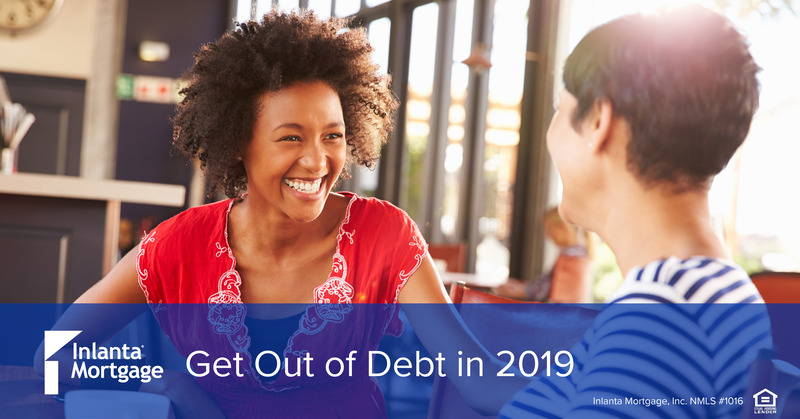 The first thing you must do to move forward with a plan to reduce your debt is sit down and take a hard look at your finances and just how much debt you owe. Once you’ve got the details down, evaluate where your debts lie and understand that not all debt is alike. Some of your debt may be causing more of a financial strain than others, like credit cards with high-interest rates, so taking time to dig into your debt and prioritize what needs to be paid off first will help you to gain some control of your financial strains and begin your journey to debt-free living. Have you done the math? If not, step #2 of your debt reduction plan involves evaluating your income each month along with how much you are spending. This is a great time as well to truly gauge your expenses and figure out where you are being frivolous. If your income does not outweigh your expenses, it may be time to consider asking for a raise at work, taking on a second job, or, adjusting your lifestyle to live below your means in order to focus on paying off your debt. While we’d all love to have our debts paid off immediately, setting unattainable goals to have everything paid off as quickly as possible can leave you feeling drained and like living debt-free is next to impossible. After you’ve taken time to evaluate your debts, your income, and your spending, design a plan that works for you to help get you out of debt. Now that you have a plan, how will you put it into place? Whether it be that you begin setting up auto payments or you choose to completely alter your lifestyle to cut out unnecessary spending, putting daily practices in place to help you achieve your financial goals is crucial. If this step feels like the hardest of all, remember that this is only temporary and is necessary to help bring you to financial freedom. If you’re still struggling with debt and financial woes and it seems like any plan you put in place isn’t working out, don’t be afraid to speak to a personal mentor or financial professional. Seeking advice from an expert and having a peer or mentor periodically check in with you on where you’re at with your goals can be an effective route to help you become debt-free. If you’d like to speak to one of our financial professionals regarding your situation, click here to contact your local Inlanta officer today! 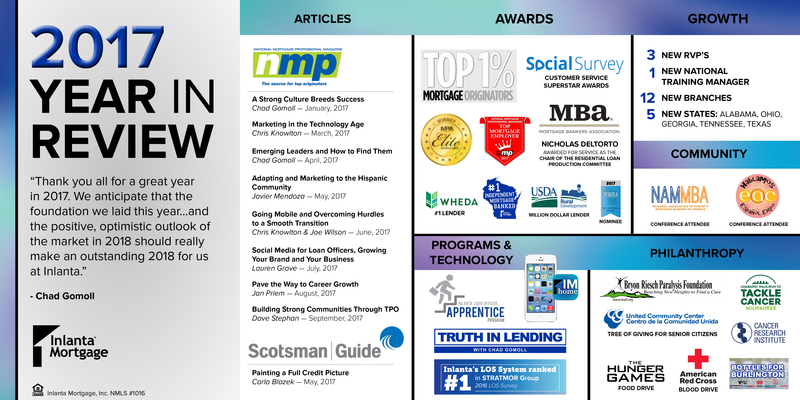 In May 2017, Inlanta Mortgage was proud to be named a Top Mortgage Employer by National Mortgage Professional Magazine. In the same month, Inlanta was also recognized as a 2016 Platinum U.S. Department of Agriculture Rural Development Million Dollar Lender. Inlanta closed out the year being named the #1 WHEDA Lender for the second year in a row and was named the #1 Wisconsin Based Independent Mortgage Banker closing the highest number of (loans) units in the state of Wisconsin. Several individuals were recognized for their achievements as well. Nicholas DelTorto (President/CEO) was awarded for his service as the Chair of Residential Loan Production Committee by the Mortgage Bankers Association and Cindy Laffey (branch partner in Overland Park, KS), Jim Snyder (branch manager in Pewaukee, WI), Rob Stettler (branch partner in Sarasota, FL), and Yvette Clermont (branch partner in Lakewood Ranch, FL, and Green Bay, WI) were recognized as Mortgage Executive Magazine’s Top 1% Mortgage Originators in America. 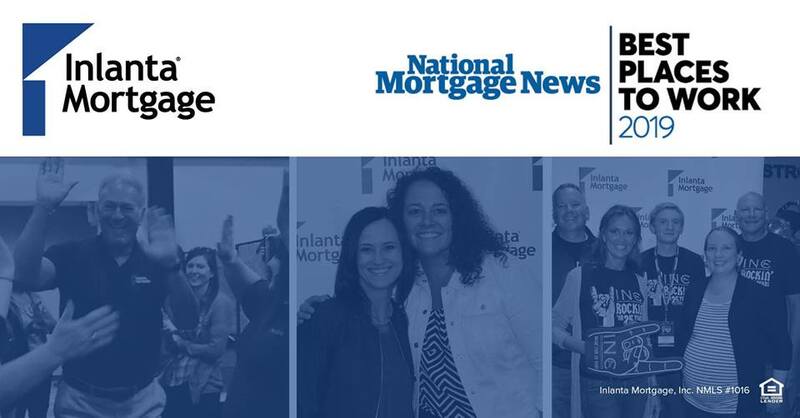 Cindy and Yvette were also recognized as MPA’s Elite Women in Mortgage alongside Jean Badciong (Chief Compliance Officer) and Katrina Cole (Business Development and Marketing in Grand Rapids, MI). Last, we had 3 members of our team recognized at the Wisconsin Mortgage Bankers Association’s (WMBA) Best in Business Awards. Inlanta’s Production Services Manager, Rod Weis, was nominated as Best in Leadership for the Milwaukee Chapter, Branch Manager/Senior Mortgage Consultant for Inlanta Mortgage – Greenfield, Kip Warzon, was nominated as Best Loan Originator for the Milwaukee Chapter, and Inlanta Mortgage – Green Bay Processor, Samantha Gates, was nominated for Best in Processing for the Northeast Chapter. Congratulations again to all of our superstars! 2017 was certainly a year of growth for Team Inlanta. The company welcomed three new Regional Vice Presidents; Brain Jensen, David Williams, and Kevin Laffey, along with a National Training Manager, Jennifer Jensen aboard. Inlanta expanded into 5 new states and added 12 new branches as well. Inlanta also invested in evolving technology strategies by embracing the #1 ranked LOS System by the STRATMOR Group, rolling out a brand new mobile app called IM home, implementing a new video series, and starting a preliminary apprenticeship program. This past year, we enjoyed showcasing our new Home Office in Pewaukee, WI, to business partners, friends, and fellow members of the Inlanta family with an Inlanta Open House and ribbon cutting ceremony this past July. Several members of our Inlanta family were present at events in local communities including an Hablamos Espanol expo in Illinois and the National Association of Minority Mortgage Bankers of America (NAMMBA) conference in Atlanta. Inlanta celebrated another great year of success at our Annual Sales Conference in Sheboygan, WI featuring an awards ceremony, top producers panel, motivational speakers, and more! Another highlight of the event included the presentation of the Customer Service Superstar Awards presented by Craig Pollack from Social Survey. Congratulations to Craig March, Dee Cayo, Yvette Clermont, Herb Lessmiller, and Jason Kupka for having the top customer satisfaction ratings in the company. Here at Inlanta Mortgage, we are always looking for ways to give back to our community. In honor of the many friends and colleagues who have cancer, have lost their battle to cancer, or know someone with cancer, we have made it our philanthropic mission to help find a cure. In July, a group of Inlanta employees participated in the Lombardi Walk/Run to Tackle Cancer in Milwaukee. The group asked fellow Inlanta employees, family, and friends to donate to the cause and raised a total of $1,500. They then spent the day at the Henry Maier Festival Park to participate in the Walk/Run. At our Inlanta Annual Sales Conference, our team also raised a whopping $24,541 for the Cancer Research Institute through raffle & silent auction! To learn more about the Cancer Research Institute, please visit www.cancerresearch.org. In May, we had the privilege of meeting Bryon Reisch and hearing his incredible story at our Annual Managers Summit. Inspired by his story, our employees donated $1,700 to the Bryon Riesch Paralysis Foundation, which matched & exceeded our company’s original donation of $1,500! In total, we’ve raised $3,200 to help find a cure for paralysis! Inlanta held two blood drive for the American Red Cross in 2017, giving the employees a chance to come together at our Inlanta Home Office to save a total of 179 lives. Thank you to our donors! In September, we held a raffle as part of our 13th Annual Sales Conference. We raised a whopping $24,541 for the Cancer Research Institute (CRI), an organization that provides funding for lifesaving immunotherapy research. This was the third year we raised money for CRI and we look forward to continuing our work with them. Further, we wanted to help local families in need during the holidays. Our corporate office and Pewaukee branch participated in Inlanta’s second annual food drive competition. Each team competed to bring in the most food items to become the competition victors. The winning team, our Underwriting department, donated 606 items! In total, we collected 2,984 food items for the Pewaukee Food Pantry. As the holiday season approached, we were grateful for the chance to give back to our Pewaukee community by participating in a “Tree of Giving” for local senior citizens from the United Community Center. Our Pewaukee branch also participated in a holiday gift drive supporting 21 children in need this year. We are grateful beyond measure for another successful year in 2017 and look forward to a bright future in 2018, which marks 25 years of excellence for Inlanta Mortgage, Inc.! If 2017 wasn’t your year financially, don’t fret. We’ve got 8 financial resolutions ready for you to put in place to ensure you become strong in your finances in the new year. If you’re like most people, you are entering a new year while still bound to old debt. It is important to understand, though, that not all debt is alike. Some of your debt may be causing more of a financial strain than others, like credit cards with high-interest rates, so taking time to dig into your debt and prioritize what needs to be paid off first will help you to gain some control of your financial strains in the new year. Have you done the math? If not, now is the time to sit down and evaluate your income each month along with how much you are spending. This is a great time as well to gauge your expenses and figure out where you are being frivolous. If your income does not outweigh your expenses, it may be time to consider asking for a raise at work, taking on a second job, or adjusting your lifestyle to live below your means. What is the first thing you currently do when payday rolls around? Are you paying yourself first and foremost and investing in your own future? If not, this is truly an important goal to set for 2018. Having a financial cushion set aside for emergencies or unexpected expenses can help save you from financial distress. Start by opening a new savings account at your bank and set aside money each month to help build your rainy-day fund. Do something your future self will thank you for. While investing in a retirement fund may not be the most exciting way to spend your hard-earned paycheck, it is crucial to ensure your future is secure. Think of it as very delayed gratification. Just as you are likely focusing on building healthy habits for yourself in the new year, building healthy credit habits is important too. Having solid credit can help you to achieve some of your biggest financial dreams – like owning a home of your very own! That is why it is important to build credit and maintain healthy habits early on like making ALL of your payments on time, keeping your balance low, and checking your credit score often to ensure you are staying on track. If you’d like more tips on how to build and maintain healthy credit, contact your local Inlanta Mortgage financial expert to discuss your situation today. If you haven’t done so already and are struggling to save money, setting up auto payments that automatically transfer money from your paycheck to your savings account can help you build your savings. This may look like your account is taking a hit at first, but soon, you will adjust and be glad you did it. Have you heard of the 50/20/30 rule? If not, there’s no better time like the new year to start a new tradition! The 50/20/30 rule involves using 50% of your income for “essential living” (this means paying your rent, utilities, groceries, car insurance, phone, credit card, etc. ), 20% goes to financial goals (savings, retirement, investments, etc. ), and finally, 30% goes to your personal spending (yes, you still get to have a life!). To learn more about this method and how to put it to good use, check out this article from The Penny Hoarder today. While the holiday season is a joyous time of year full of laughter, love, and cheer, it can also be a time full of stress and financial despair. According to a study completed by the American Research Group, Inc., the average American is expected to spend over $900 on gifts for family, friends, and loved ones this holiday season alone. If you don’t have $900 already set aside for gifts this season, you’re not alone. That’s why we’re bringing you some great ways to stretch your holiday budget and save you from financial distress. Make a Plan: First things first – sit down and take a hard look at your finances, how many people you’d like to purchase gifts for, and what your budget will allow. Making and pricing out a list will also help you to stay on track and on budget. Do your Research: Have your eye on a specific gift for someone? Don’t jump on the first deal that comes your way. Try comparison shopping online or download a digital coupon app like RetailMeNot for deals and discount codes. Sign up for Email Alerts: If you’ve got several favorite stores, make sure you sign up for email alerts to receive news and information on sales and discount offers. Pay with Cash: While it’s tempting to charge up your credit card for gifts you think your family and friends will really love, setting a strict budget and taking out the exact amount of cash you plan to spend will help you to avoid that post-holiday debt. DIY: It’s truly the thought that counts, so why not channel your creativity to make your own, personalized gifts for your loved ones? With the robust internet today, you should have no problem finding a number of ideas. Try checking out Pinterest to get you started. Set a Limit: There’s no harm in proposing a monetary limit with family and friends to help you stretch your budget on gifts this year. It is likely that they are in the same boat as you are and will welcome the gift limit idea. So, leave the stress behind this season and use these handy tips to help you stretch your holiday budget. It’s the season of giving. So, why are we spending so much? If you’ve signed up to host Turkey Day this year for your family and friends, here are some ways to save you from financial distress while planning the perfect holiday get-together. Take a minute to sit down and plan out how many people you can comfortably accommodate in your home as well as how many people you can afford to invite. This will help you determine the size of your party and how much food and drinks you will need to serve. Now that you’ve got the numbers down, it’s time to plan your budget and your shopping list. Remember that Thanksgiving is a time to gather and enjoy a feast with those you love, so have some fun planning the menu and don’t forget to take into consideration your guests’ dietary needs and restrictions. Just because you are hosting the event doesn’t mean you can’t ask your guests to bring a bottle of wine, extra dessert, or side option. With you taking on the hosting duties and responsibilities, your friends will likely prefer not to show up empty handed and will be more than happy to help you out. There’s no need to stress yourself out even more by rushing to the store the night before the big event. Plan ahead and shop early, picking up items you need as you go along. This will help you avoid an overflowing shopping cart, an extra-long grocery receipt, and a hefty credit card charge. Don’t forget to check for coupons online or in store as well when doing your shopping. While seasonal home decor always adds a nice touch, it is important to remember that you can still fill your house with holiday cheer without breaking the bank. Check out Pinterest for these awesome DIY Thanksgiving decorating ideas or head to your local dollar store for inexpensive party extras. With the heat of the oven and baked dishes, along with all the extra guests hustling and bustling around your kitchen, you can opt to save a little extra on your heating bill this month by turning down your thermostat. In the chaos of it all, take time to remember the reason why we celebrate and appreciate the love that is shared amongst family and friends this time of year. No matter how extravagant your event turns out to be, there is greater importance in gathering together than there is in spending your savings on dinner. Looking for more ways to save this season? Check out these 50 Ways to Save Money on Your Thanksgiving Dinner. From all of us at Inlanta Mortgage, we want to wish you and yours a very Happy Thanksgiving and joyful holiday season!